S.J. 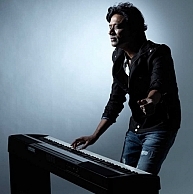 Suryah succeeds as a music director! The director turned actor is now, producer turned music director. S. J. Suryah was once the most sought-after director in the industry. He then got into a spree of acting commitments. After a hiatus, the story-teller is back with Isai, a project that has taken years to complete. Composing music is no simple task. All of Suryah's films with Deva and AR Rahman had blockbuster songs in it. Suryah confesses, his days with Rahman were the reason behind his transformation into a music director. Having had some first hand access on the songs from Isai, the tracks sound ambitious and original. The compositions are professionally treated with an intent to comprehend the story that is touted to be horror. We should wait for his background score to make further comments. Way to go S.J. Suryah! Suriya's Masss to have cameos by Rana and Prabhas ?